The longest global coral bleaching event in history is now devastating reefs in the crystal clear waters of the Maldives, with images released to the Guardian powerfully illustrating the extent of the damage there. Photographed by the XL Catlin Seaview Survey, the images captured the event in May as it moved beyond the now devastated Great Barrier Reef and into waters further west. 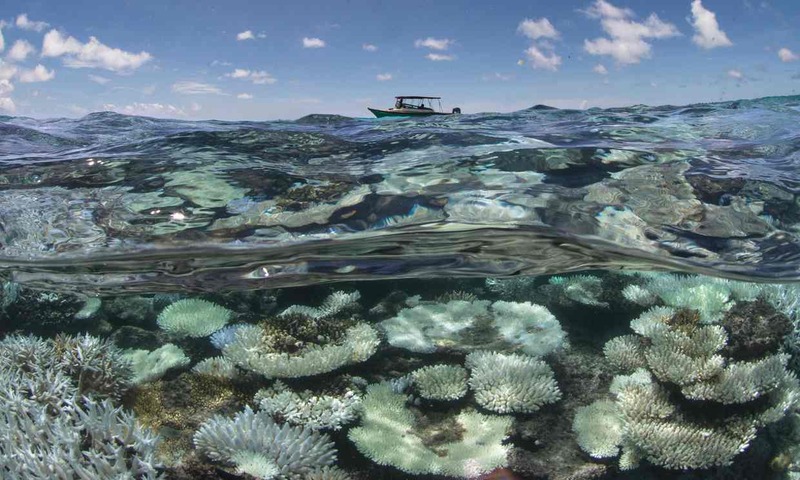 “The bleaching we just witnessed in the Maldives was truly haunting,” said Richard Vevers, founder of the Ocean Agency. Sp how is coral bleaching a sign of climate change? When coral sits in water that is too warm for too long, it gets stressed and expels the algae that provides it with about 90% of its energy. If it stays stressed for more than a couple of weeks it starts to starve, become diseased, and dies. Extreme El Niño winds spread warm water across the Pacific and warm the globe, pushing coral closer to their thermal limits. Extreme El Niños were not seen before 1982 but have occurred three times since. Extreme El Niños are expected to increase in frequency as a result of climate change. A new study has found the conditions that led to the devastating bleaching on the Great Barrier Reef were made 175 times more likely by climate change, and on the current trajectory, would become the average conditions by the 2030s. The Maldives is series of coral atolls, built from the remains of coral. The livelihoods of people there depend on the reefs through tourism, fisheries and as a wave-break that helps prevent inundation on low-lying islands. The photographs were part of an ongoing project, in partnership with Google, the University of Queensland and the US National Oceanic and Atmospheric Agency to capture the global bleaching event as it moves around the world. “We’ve been following this third global bleaching event since the start nearly two years ago and just when you think you’ve seen the saddest sight you’ll ever see, you see something even worse,” Vevers said.